It should go without saying, before you make changes to things, create a back up. If you follow the advice in this post and screw things up, then do a fresh install of VCDS. 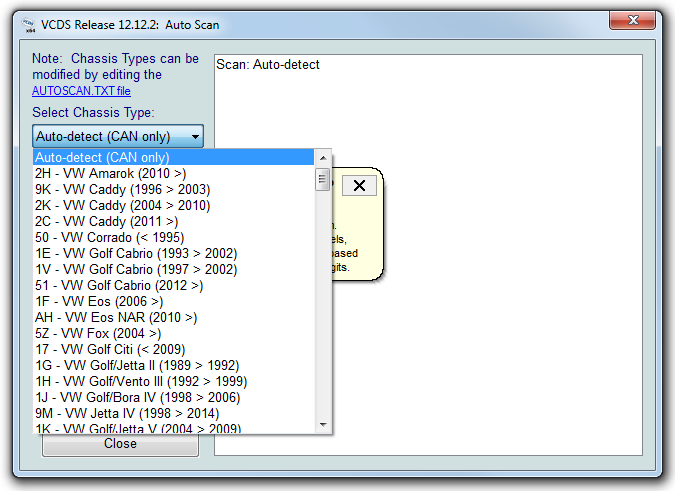 When you go to do the Auto-Scan, you have to select the type of vehicle from a list. With newer VW, Audi, Seat and Skoda vehicles that use the CAN Gateway for diagnostics, you can simply select the Auto-detect (CAN only) from the top of the list. But for older vehicles that use the K-Line for diagnostics, you need manually select from the list. But there may be cars listed that you will never see in your market. For example, here in North America, there is little chance we'll work on a Seat of Skoda. This list can be modified. 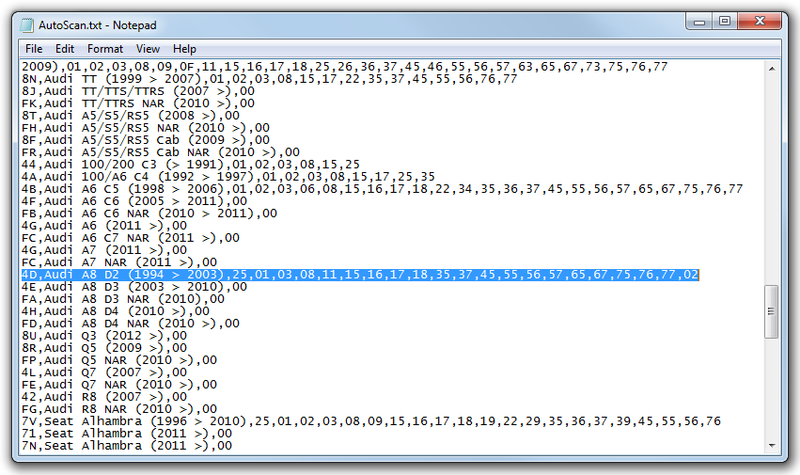 From the Auto-Scan screen, in the upper left, click on the AUTOSCAN.TXT file link. Your Notepad should open up. From there one can select, for example all of the Seat vehicles and then delete them. 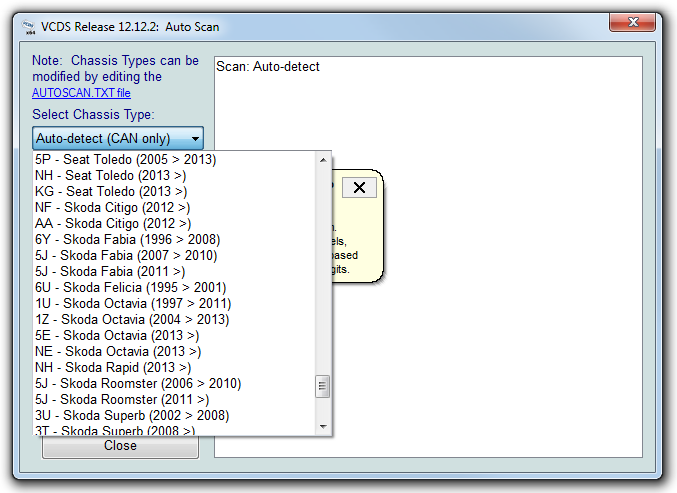 Now save the updated AUTOSCAN.TXT file. Next time you go into Auto-Scan, you would find your Audi A8 at the top of the list. 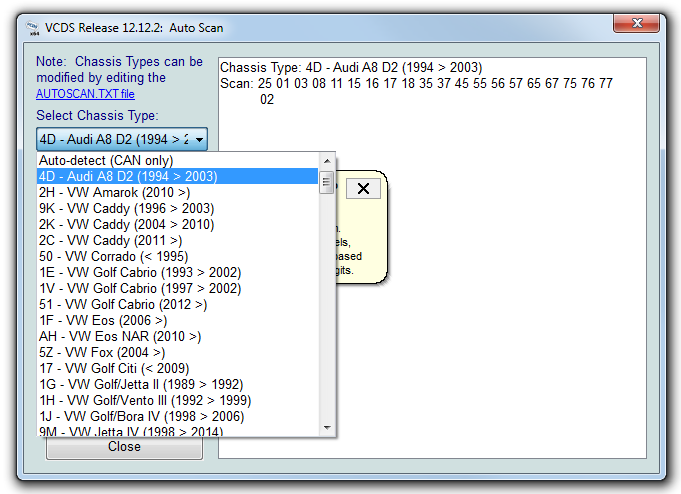 Note that when you do another install or update of VCDS, the AUTOSCAN.TXT file will revert back to the original state. When you "paste" your favourite vehicle to the top of the list, can you also remove modules from the list that are not fitted? My "new" (to me) Audi only has about 8 modules fitted but VAGCOM spends a large amount of time trying addresses for those that are not fitted. If I delete them from the vehicle list, will it cause any other issues? That's perfectly fine, although you should use MyAutoScan.txt if you're making custom entries. It is, in fact, the entire point of that file: to create a custom Auto Scan module list containing only the modules you care about, that will be preserved across upgrades. 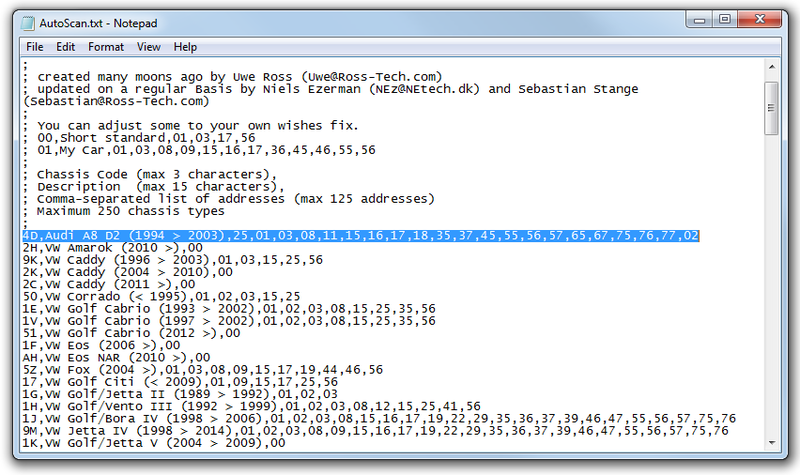 We concluded it would be better for user-made entries to go in a separate file so they won't get overwritten when the software is updated. Other than that, it works exactly the same. So how do I add my car? 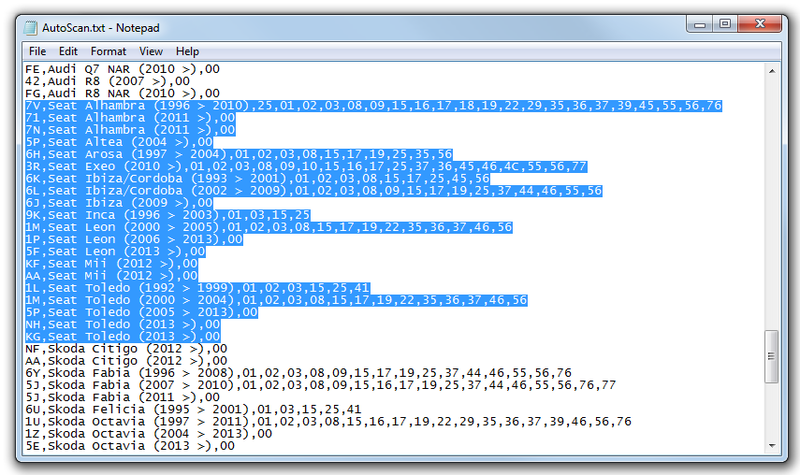 Another thing I noticed is that on some peoples scan it gives an explanation of the scan numbers, how do I add that? Or show the Autoscan from your car here, and we make it for you.